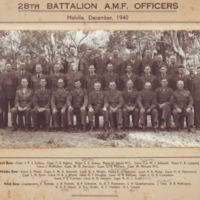 Front row- Colless, Adams, Green, James, Anketell, Leppard, McMullen, Davidson, McEwin, McLean. Middle row - Masel, Stanwell, Wright, O'Halloran, Halse, Hammond, Gorn, Wood, Douglas, Raphael, Cumpston, Curnow, Herbert, Scott. 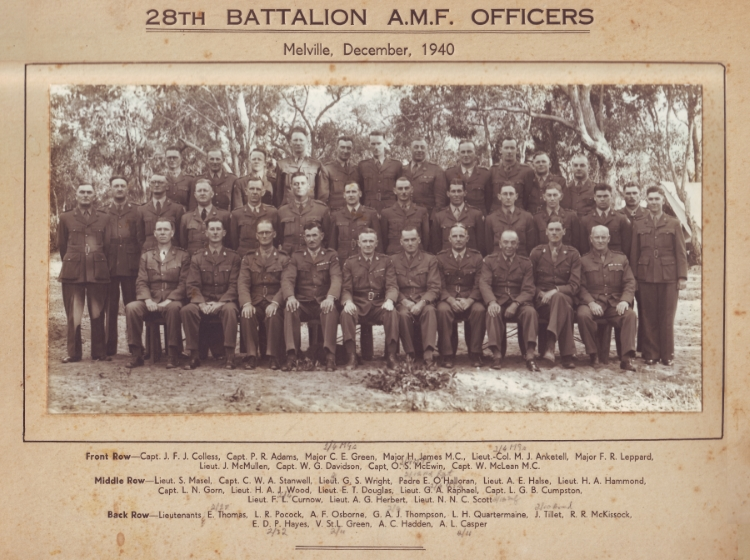 Illustrations Ltd., Perth - Photographer Unknown, “28th Battalion Officers - Melville, December 1940,” The WAGS & AMWA Collections, accessed April 24, 2019, http://wagsamwa.wags.org.au/items/show/5.